this 1971, 34 kW (45 hp), four-stroke unit. camshaft, and has twin contra-rotating balancer shafts. 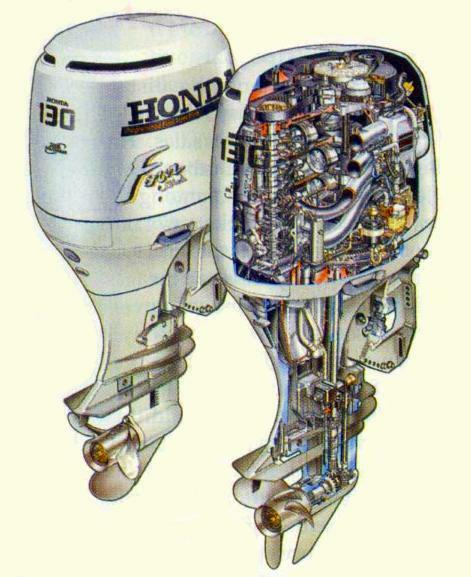 For its fuel system, Honda adapted its automotive electronic PPG-FI, short for programmed fuel injection, to the engine, the first such application in an outboard four-stroke engine. Steady idling is an important requirement for an outboard, as for low-speed trolling. 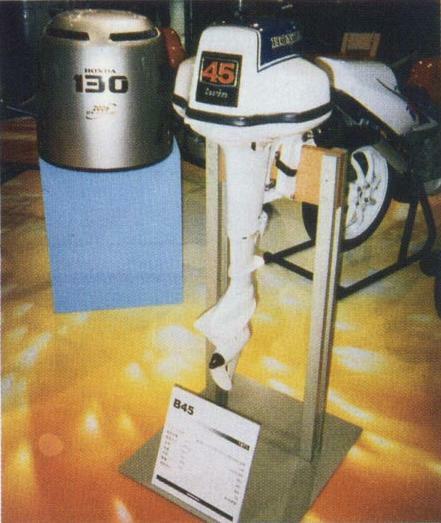 The BF115/130A's idle control system attains steady idling and trawling speed of 650 rpm (vs. the Civic-based, carbureted BF90A's 850 rpm), by EACV, or electric air control valve, which regulates bypass air volume introduced to the intake manifold. The EACV also eliminates a screw-type idling adjuster, and enables engine start-up without manipulating the throttle. The BF115/130A's ignition is fully transistorized, and the ignitor is built within the engine control unit (ECU).